The newly improved Berkey shower filter is easy to install, eliminates all undesirable odors and makes showering the pleasant experience it should always be. Significantly reducing chlorine, hydrogen sulfide, scale and iron oxide (rust) the Berkey shower filter gives you the benefit of showering in clean filtered water without the adverse effects of chlorinated water. Simply screw the Berkey shower filter in between the shower pipe coming from your wall and your existing shower head or between the tap and shower hose and you're good to go! The improved Berkey Shower Filter will typically last 75,000 liters (16,000 imperial gallons) or one year, whichever comes first. Since chlorination is a long established public health practice necessary for the disinfection of drinking water, people are aware of the health benefit drinking filtered water can provide. However, it's surprising for some people to learn that 50% of their daily exposure is in the shower. The other 50% comes from their drinking water. Therefore, filtering shower water is equally as important as filtering drinking water. In the shower environment, chlorine can either be in liquid or gas state. At higher water temperatures in the enclosed shower stall, free-chlorine moves from the liquid to the gas state, where it vaporizes and subsequently is inhaled. Documented scientific studies (see below for extracts) conclude that taking long hot showers is a potential health risk. In the enclosed shower stall chlorine vaporizes upon which it is inhaled. To a lesser degree, absorption through the skin also occurs. Medical studies suggest a link between absorption and inhalation of chlorine in the shower environment with elevated risks for disease and serious illness. Showering in chlorinated water may also cause pre-existing conditions such as asthma and eczema, to become exacerbated. Using a patented blend of high purity calcium, copper and zinc, the Berkey Shower Filter works on a similar principle as a catalytic converter in a car. In shower filtration free-chlorine is converted into a harmless chloride. The scientific name for this chemical reaction is known as "Reduction-Oxidation", commonly referred to as Redox. Simply stated, during a Redox reaction electrons are transferred between molecules, creating new elements. For instance, when free-chlorine comes in contact with the filtration media, it is changed into a benign, water-soluble chloride. This reaction changes free-chlorine to a larger chloride element, too large to evaporate or be absorbed by the skin. It is then carried harmlessly through the water supply. In addition to the benefits of filtering water, there are cosmetic benefits. Symptoms of chlorine exposure are dry and/or flaking skin, dry brittle hair and red irritated eyes. Filtering your shower water reduces these symptoms! The materials used in the Berkey Shower Filter are high-purity copper-zinc formulations used in treatment applications to reduce heavy metals, hydrogen sulfide, microorganisms, and scale. Water filtered through redox media controls microorganism growth. High-purity copper-zinc redox materials consistently remove 99% of free chlorine by electrochemically reducing dissolved chlorine gas to water-soluble chloride ions. Attention: If possible do not use the Berkey Shower Filter with a shut-off valve. If a shut-off valve is absolutely necessary, please make sure it is installed inline above and before the Berkey Shower Filter. Use of a shut-off valve after the Berkey Shower Filter may result in excessive pressure buildup inside the Berkey Shower Filter causing the filter to be damaged and voiding your warranty. For more information on the proper installation of a shut-off valve, please contact your Berkey distributor, or click here for more information. Do not use shower heads with flow rates greater than 9.4 liters (2 Imp. gal.) per minute at 60 PSI (4.1 bar). 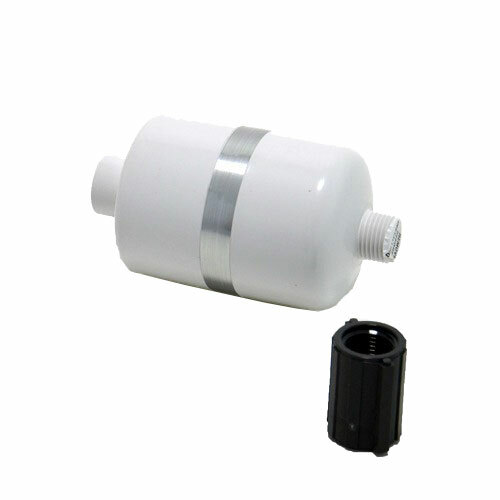 To do so will reduce the effectiveness of the Berkey shower filter. Do the Berkey shower filters remove heavy metals? The Berkey shower filter reduces free chlorine, hydrogen sulfide, scale and iron oxide (rusty water). However, the Berkey shower filter does not remove heavy metals.